This writing is meant to restitute — a year later, to the best of my recollection — the contents of a series of six lectures I gave in Udine, at the Centro Internazionale di Scienze Meccaniche, within the framework of the Course on Classical and Advanced Theories of Thin Structures: Mechanical and Mathematical Aspects (June 5–9 2006). For this reason, I have made an effort to keep my presentation style informal and colloquial, even when, here and there, I have added some complementing material. There are three parts. 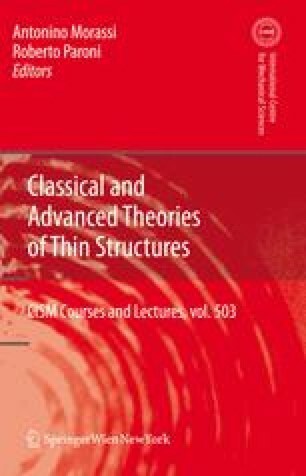 In the Premiss, I try and explain why and how, to my taste, the mechanics of thin structures should be presented; in particular, I introduce the direct and deductive approaches and I collect a few bits of history of the latter, in its two main variants, the asymptotic method and the method of internal constraints. Section 2 is devoted to an exposition of the method of formal scaling, a unified approach to classic rod and plate theories that is an outgrowth of the method of internal constraints. Finally, in Section 3, I discuss how to best approximate the stress field in a linearly elastic structure-like body, by exploiting the freedom in the choice of reactive stress fields that maintain the constraints.